The Dabang Delhi K.C. team of Delhi has been part of the PKL since season one. Although the team has seen a list of star players come and go, it has never really finished a season on a high. Looking to better their performance in 2018, Dabang Delhi K.C has taken multiple steps to fine tune their approach and invest in talent and training. Season six sees a new coach for the Dabang Delhi team, Krishan Kumar Hooda whose diverse sporting experience will surely reflect on the team’s performance. The Dabang Delhi owner is Mrs Radha Kapoor Khanna, the only female owner in the PKL and the team’s home ground is the five thousand capacity Thyagaraj Sports Complex in Delhi. The 2018 auction saw team Dabang Delhi K.C. select and bid for some players with high calibre and retain most of their best performers. Retaining Meraj Sheykh and bringing in Rajesh Narwal, the team now has two of the best all-rounders in the franchise. For the current season, the Dabang Delhi Pro Kabaddi Team seems to have created a good balance of specialities with a good mix of defenders, raiders, all-rounders and young talents. Joginder Singh Narwal takes over as the Dabang Delhi captain for 2018. Joginder is a veteran of the game and his versatile experience will be vital to the team’s performance this season. Joginder started his PKL career with the Bengaluru Bulls in season two and had also played for Puneri Paltan and U Mumba. Rajesh Narwal will have the mighty responsibility to perform on both sides of the mat for Dabang Delhi. The brawny all-rounder has had a long career with the title-winning Jaipur Pink Panthers before switching to the U.P. Yoddhas and finally moving to Dabang Delhi K.C for 2018. Rajesh Narwal finished season three behind Manjeet Chillar as the second best all-rounder of the PKL. His quick raids and strong defensive skills make him a valuable asset to the Dabang Delhi K.C team. With four season appearances, Thailand’s Khomsan Thongkham has played only a couple of matches. But he seems to have some strong raiding skills that Dabang Delhi K.C could benefit from. The Iranian player Meraj Sheykh has impressed viewers since season two and has never failed to deliver. As a star performer in raiding and defending, Meraj is a great asset to the team and among the top point scorers in PKL. Meraj was the first foreign player to lead a team when he was selected as the captain for the Telugu Titans in season two. He has also been part of Iran’s 2016 Kabaddi World Cup team and comes into PKL season six as the most successful all-rounder of season five. Raider Chandran Ranjith was acquired for a big sum at the auctions, his raiding experience and consistency make him a dependable point scorer for the team. Dabang Delhi K.C Raider Pawan Kumar Kadian was a star performer at U Mumba for three consecutive seasons of the PKL before he moved to the Bengaluru Bulls and then the Jaipur Pink Panthers for one season each. His numbers say it all and he has always finished his seasons high on the raiding leaderboard. Defender Ravinder Pahal is often seen as one of the best players in PKL. His unflinching focus makes him one of the most lethal ankle hold experts in the tournament. He finished season two as the best defender of the league and has over 200 tackle points to his name. The Dabang Delhi team 2018 are certainly looking strong for season six and only time will tell how this new team will perform. Apart from the distinguished list of seasoned Dabang Delhi players, the team has also brought in some new faces who will be yearning to make an impact in the sport. 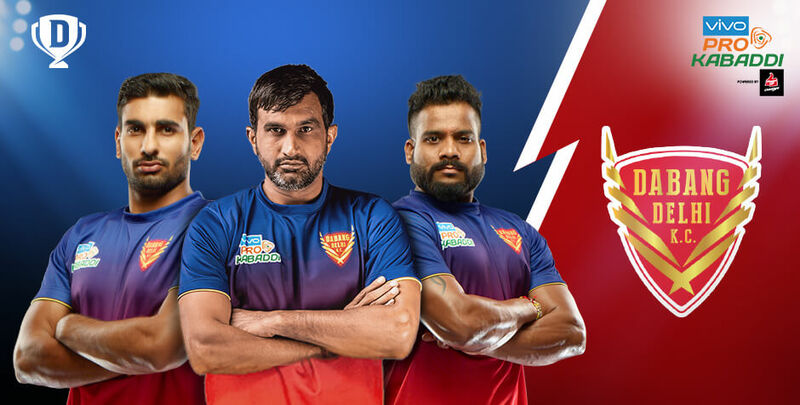 As you get spoiled for choices with the Dabang Delhi team, put your sports skills to the test and pick out your top performers for season six only on Dream11. Come and be part of a vibrant online community of sports enthusiasts to enjoy duels of your own with a host of contests and mega contests. Get started with your own team to win against the best. Dream11 lets you play as the manager of your team before every game. So, follow the schedule closely and make your pick before every pro kabaddi league game. Log on to the official website or access from anywhere via the Dream11 mobile app. Hurry and join in on the excitement today!